five circuit processional labyrinth with meanders / double spirals leading into and out of the labyrinth proper. 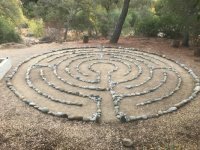 The labyrinth is located at my home. Visitors are welcome by appointment. This labyrinth is a six-circuit Medieval labyrinth based upon the Abingdon manuscript from the 11th century.